Have Fun with the Water! ----- Hapilife What is Hapilife? 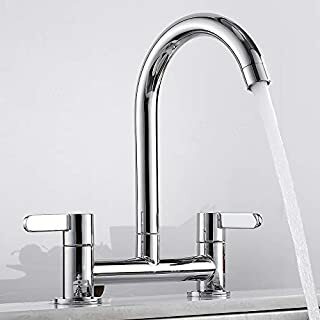 Hapilife offers a serious of thoughtful designed of kitchen and bath taps, showerheads, accessories, bath safety products and kitchen sinks for residential and commercial applications. Humanized design combined with quality you can see and feel in kitchens and bathrooms from Hapilife. We are trying to help you to built a hapilife,and hope you will enjoy it with your family. What is 10 years guarantee? The "Warranty Period" for homeowners is 10 years and the "Warranty Period" for non-homeowners is 5 years. 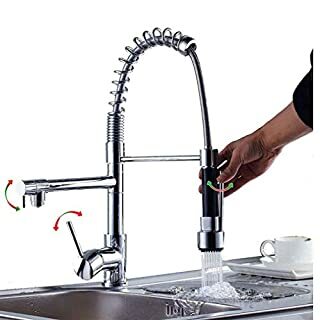 During this period, any part or finish of the Hapilife taps are warranted to the original consumer purchaser as long as it proves defective in material and/or workmanship under normal installation, use & service. 30 days Return policy: we guarantee you get the item you ordered or your money back! Why choose Hapilife? 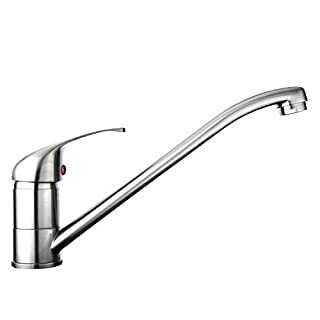 1.No discoloring: Multiple polishing and chrome finish prevent it to be rusty and highly reflective for a mirror-like look 2.No leaking: Made of the heavy and refinded quality copper, durable construction with a strong ceramic cartridge which was tested 500,000 times 3.No problem: Well package comes with UK standard fittings and detailed instruction, ideal for both DIY and professional tradesman 4.No cheating: 10 Years Warranty and 30 days return policy for Hapilife products. We don't put the price up or down throughout the year like other sellers.The price you got is the low and resonable price. 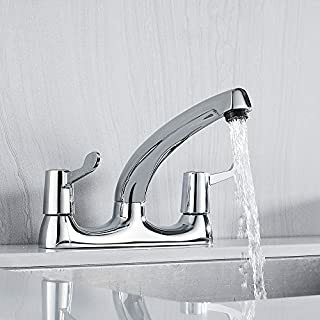 Is this tap suitable for the low water pressure? Minimum 0.5 bar, 1 bar is recommended What package included? 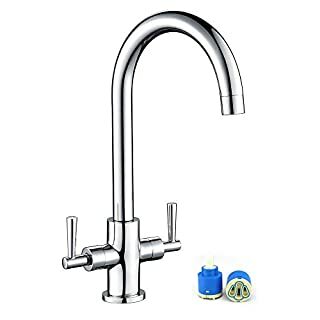 1 x mixer tap Instruction comes with UK Standard fitting hoses ps: All the parts you need to fix this tap are included in the box. For many homes, the kitchen is the most important area. 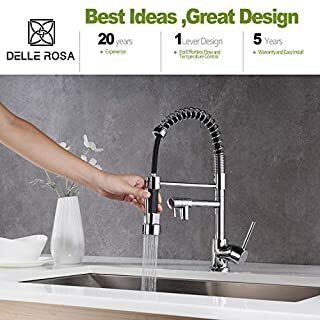 And the sink is the most important and well used area in the kitchen. It's important in preparing your meals and also cleaning up afterwards so this area needs to be functional, and very easy to keep clean. 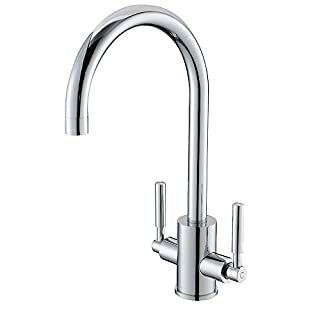 The best kitchen tap choice for matching your sink is the mixer tap. 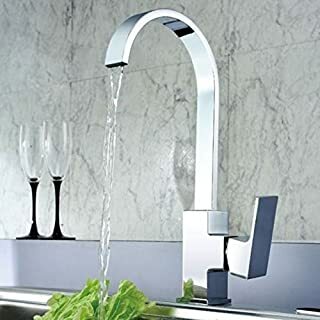 Why Choose Our XIFIRY Mixer Tap? 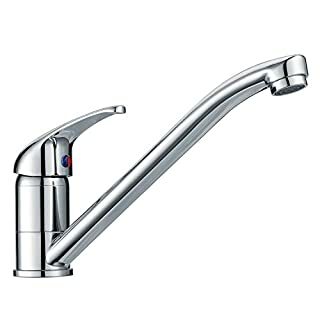 ✔Hot and cold water supplied for comfortable usage in any season ✔Dual level for easy and accurate water temperature control ✔Swivel spout for easy access ✔High quality brass material for long lasting usage ✔Bright chrome finished surface for elegant look ✔Filter bubbler for saving water and smooth water flow ✔Ceramic valves for smooth handle operation and water leakage prevention ✔Quality assurance for no worries! 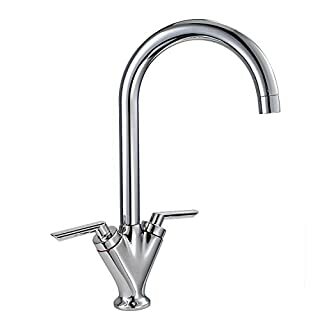 Specific Material: Brass Finish: Chrome Cartridge: Ceramic Design: Dual Level/Swivel Spout Water Pressure: Min 0.5 bar, 1 bar is recommended Weight: 2.0kg Height Overall: 300mm/11.8inch Package Included 1 x Sink Mixer Tap 2 x UK Standard Water Hoses 1 x Fitting Kits(includes all accessories for installation) 1 x User Manual Notice Please allow 1-2cm error due to manual measurement. 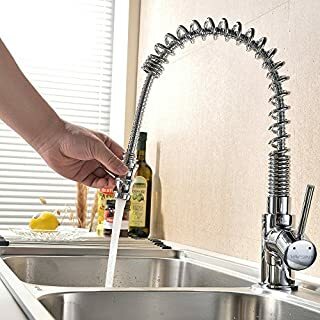 ❤If there's any problem of the kitchen sink mixer tap, please don't hesitate to contact our customer service and we will absolutely give you a 100% satisfactory solution. 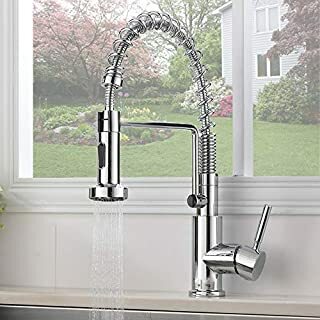 SEVETILKA Modern Chrome Stainless Steel Spring Swivel Spout Single Handle Kitchen Tap,Pull Down Pull Out Durable Spray Kitchen Mixer Tap. 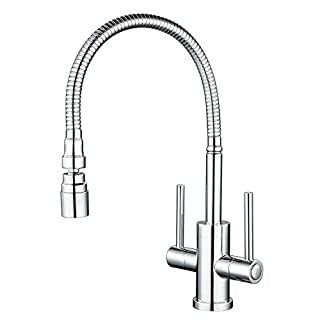 Swivel spout to allow water direction to be altered. Suitable for both low and high pressure systems. High shine chrome plated finish. 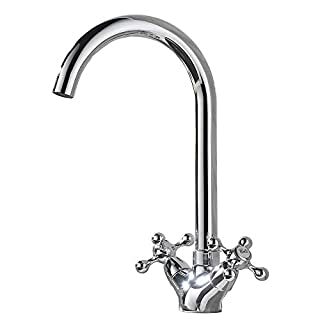 Dual control lever handles for ease of control and flow or temperature setting. 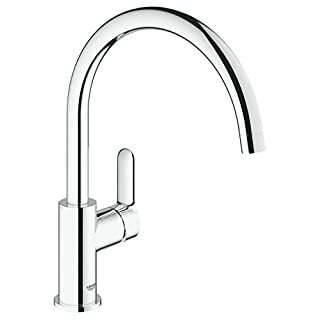 ATUM HOME tap is tailored to perfection and it creates the cleanest look that works with all decorating style.1.Contemporary design makes your kitchen more fashion and creates a stronger sense of belonging.2.Heavy duty commercial style design ,not only looks nice but also works great.3.It makes a healthy life for a family,help your children and your parents live in a carefree.Specifications:Color/Finish :ChromeWater Mode: StreamHandle style: Metal Lever.Double Handles.Special Cross Handle.hose: 1/2 inch hoseDimensions:Overall height:310mm;Spout Height:225mm;Spout Reach:165mm.Feature:Spout Swivel：360°SwivelSpout Fuction: Simple one spout,streamWater Feature: Mixed Hot and ColdPackage Includes:★ 1 * Kitchen tap★ 2 * 1/2 inch Hot & Cold Water Hoses★ Mounting accessoriesAfter Sale:If you have any problems and suggestions with the product, please contact us by Amazon email at the first time. Normally, you will get reply in 24 hours. Thank you for your understanding and cooperation. 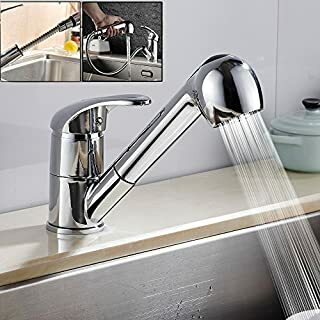 Hapilife offers a serious of thoughtful designed of kitchen and bath faucets, showerheads, accessories, bath safety products and kitchen sinks for residential and commercial applications. Every product of Hapilife is delivering the best possible combination of meaningful innovation, useful features, and lasting value. Our success is due to the long, continued relationships with our customers. Whether you're shopping with us for the first time or have bought from us many times before, our goal is to make your shopping experience as informative and as easy as possible. Your comfort, security and confidence are our utmost concern. Hapilife makes your life happier! 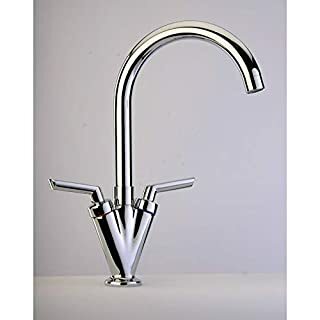 Package Contains: 1 x mixer tap comes with fitting hose Will it work in my kitchen? 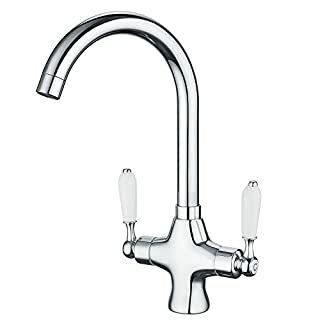 For this tap to operate, your water system will need to produce at least 0.5 Bar of pressure, however we recommend 1 bar for optimal performance.This can be achieved if you have one of the following: Combination boiler systems Gravity fed systems (only with a pump) Megaflow system Pumped hot water systems Un-vented hot water systems Warranty : The "Warranty Period" for homeowners is 10 years and the "Warranty Period" for non-homeowners is 5 years. 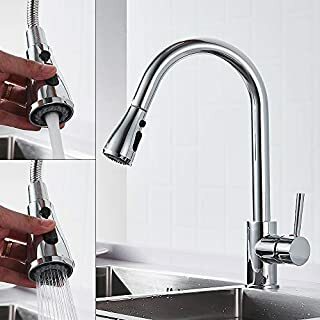 During this period, any part or finish of the Hapilife faucets are warranted to the original consumer purchaser as long as it proves defective in material and/or workmanship under normal installation, use & service. If you need some further informations, feel free to contact us.